Posting: The first Wednesday of every month is officially Insecure Writer’s Support Group day. Post your thoughts on your own blog. Talk about your doubts and the fears you have conquered. Discuss your struggles and triumphs. Offer a word of encouragement for others who are struggling. Visit others in the group and connect with your fellow writer - aim for a dozen new people each time. Be sure to link to this page and display the badge in your post. And please be sure your avatar links back to your blog! If it links to Google+, be sure to change it as Google+ is going away in January. Otherwise, when you leave a comment, people can't find you to comment back. Our Twitter is @TheIWSG and hashtag #IWSG. Every month, we announce a question that members can answer in their IWSG Day post. These questions may prompt you to share advice, insight, a personal experience or story. Include your answer to the question in your IWSG post or let it inspire your post if you are struggling with something to say. Remember, the question is optional!!! May 1 question: What was an early experience where you learned that language had power? My awesome co-hosts for the May 1posting of the IWSG are Lee Lowery, Juneta Key, Yvonne Ventresca, and T. Powell Coltrin! Insecure Writer’s Support Group Website!!! *DO NOT add a direct link to your post here! This group posts EVERY month. If you sign up and miss one first Wednesday, that's all right! Those who sign up just to advertise or miss two postings in a row will be removed so as not to waste group member's time. Please refrain from posting non-writing related tangents under the IWSG badge. We believe in freedom of speech, but please relate your post to the life of a writer in some fashion. Those who don't will be given a warning. If done a second time, you will be removed from the blog hop list. Guest posts for IWSG Day are acceptable, but the post should address writing insecurities in some way. Blogs only - no Twitter, Facebook, or other social site. Thanks for respecting the purpose of this group! Thanks, Tessa! Just trying to help others. Just came from Ciara's blog. Fun idea. Since we're all insecure, all writers qualify. looks like there are a lot of us insecure writers out there! Thanks Alex. Thanks for joining us, Theresa and Ann! So the first one is Wednesday 7th Sept, then? Brilliant idea! I am definitely joining. Alex-I don't know if I did this right. I copied the Bar Hop code and posted it in the HTML of one of my posts. Do we key in the code each time we post or only the first Wednesday of each month, which will be 09/07/11? Glad you're with us, Murees! Thanks for doing this Alex. As someone who's very new to all of this, it's a little intmidating. It's nice to know there's people out there that care. That is a most excellent idea!!! I'm looking forward to it! wtf is going on, alex? i can't enter my own email addy??? This link has already been entered into this linky list. Duplicate links are not allowed so that linky lists will not be spammed or overloaded by readers. Are you sure you're not already signed up? I you want to send me your email and web address ( alexjcavanaugh at earthlink.net ) I will go into Linky Tools and figure out what is going on. i did sign up for ellie's trek fest, is that the problem? Major excitement happening right now! Wow, talk about good timing. I'm feeling very insecure, so I signed up! I just found out about this from a Campaigner, and it sounds like a great idea! I've become a big believer lately in writers supporting each other through the hard times, and I sometimes feel insecure about it. Thanks for putting this group together, Alex! Thanks for setting this up, Alex. I think this will be really useful to me. I thought "insecure" and "writers" were synonyms. Is it possible that they aren't? Bear can always learn something. Hope the support group works out well. Were I a writer, I'd join. But I'm just a Bear. "Bear" and "writer" are not synonyms. Yet another great idea, Alex! (I'm back, by the way--hope you had a great summer.) Once a month I might just be able to handle, although I've already missed this month's post. I'll try to get in for October (that sounds so far away!). Though I missed Wednesday I'm afraid. Next month! I've signed up but missed the 7th Sep so will have to wait til 5th Oct! Writing for newspaper was easier because hard news practically wrote itself. Writing fiction or something personal has been more difficult. A recent change to my blog fits perfectly with what we are doing here. Thanks, Alex. YA Paranormal Romance, Darkspell coming fall of 2011! 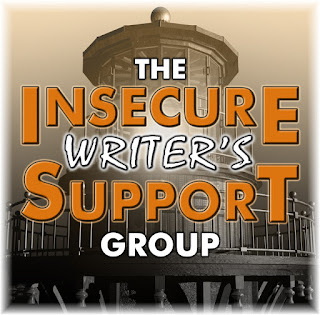 I just linked up to your Insecure Writer Group via a shout out on Angela Orlowski-Peart's blog! Obviously, I didn't get in for the September post, but I'd love to join in for October 5, 2011! I'll add the image to my sidebar - and visit around. The theme is just your current insecurity or words of encouragement. (For most of us, one a month won't be difficult.) I encourage participants to visit at least a dozen others. If you can visit everyone, great, but the list is already longer than even I can handle, so I'm hoping everyone gets a visit from someone. I'll be jumping in the first Wednesday in October. Great idea. I want to sign up, but can't get linky to work. Was checking back here to see when the next post was due...since I totally botched my first attempt at this. No excuses, just plain sorry. I don't want to get cut, I truly can be a very good team-mate! Gonna hop over and read some of these so that I'll be in good shape for October. In all seriousness, thanks for undertaking this endeavor. I really need encouragement right now. Looking forward to first Wednesday of October! Alex I guess I belong here! 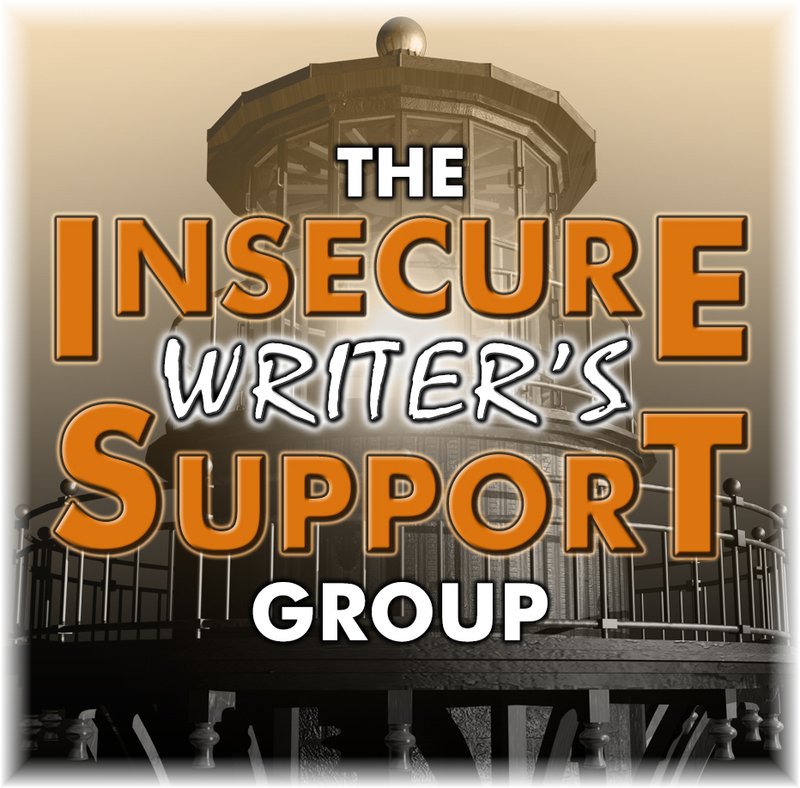 Will start the blog hop come the 1st Wednesday of October when I will be posting my first blog for the Insecure Writer's Support Group! Alex, you're wonderful! Thanks for hosting! Found out a bit late - had to get a new computer, the old one's motherboard died! What an awesome idea! Love this! My sweet, smart blogging friend Robyn "the chocolate lady" insisted that I stay and hold her hand for each of the sessions and so after much soul searching, self muttering if you ask me as to whether a India based short story writer and poetess has a place on this list....I have taken the plunge. I just hope I haven't shot myself in the foot here. I have now signed up. One day of posting about insecurity each month I think I can handle. Actually I think I've been posting more than that. I definitely want in... how do you actually join, though? I only joined blogger yesterday, so I don't really know what I'm doing! I'm still trying to find my feet. Ironically, the same goes for me as a writer, so this sounds perfect! My first post in now up! Aww... Here's big virtual hug. You rock and I can feel how much you want us all to see our dreams come true. The truth is no matter how we each come to this creative art of writing, we are here because there is something inside of us that hears the call of the Muse. I believe that we will all get our voices heard, otherwise we would not have heard the call. So cool Alex. I missed this in September due to all the internet problems I was having but I will join now. Insecurity seems to be my middle name and it's always nice to be able to share and offer help. Just so happens I've decided to offer some classes. We will see if that is a benefit to others. Hey everyone, this is my very first post with the Insecure Writer's Support Group. Looking for a little support here! Nice to meet you all! This is awesome, Alex. I am late to the game, just joined group therapy today. I love it. I was busy last month trying to salvage the lost content of my blog to no avail. I have to start over & this is a great way for me to connect and reconnect with other bloggers. Thanks you. This is a really cool idea. Hope you are well and I hope i did my linky thing correctly. If not let me know please :) This is a fantastic idea. I just hope I manage to find the time and not let anybody down!! I too am very late to the game, as I took September off to be lazy/deal with issues of insecurity/mostly to be lazy. And in my usual unorganized fashion my first post will be on Thursday! Can't wait for the first Wednesday in November. Can't wait for November for a multitude of reasons NaNo for 1. Had the most incredible experience with your Blogfest. Thank you so much. See my other site www.babsinparadise.blogspot.com for details. Can't wait for the first Wednesday in November. Can't wait for November for a multitude of reasons. NaNo for one. Thanks for all the things that you do. Sorry about that. I'm a little cyber challenged and a blond. Think it posted multiple times. I'm very, very late to the party but having clicked on about 20 names and read what they've been saying, it's a party I'd like to gate crash! Better late than never. Looking forward to it!!!!! I'm just blown away by the success of this group! would it be a pain to update my link to my new blog? or should I add the new blog and you delete the old one or what should I do? sorry for being a bother.. It's awesome! But what insecurities? Just kiddin'. Hey, Alex! Wow, how did you know I needed a group like this?? I've selected to link my blog post which I posted just days ago mentioning an incident that occurred recently. I've had insecure moments, but this one has to be the worst yet. Thank goodness for supportive writers out there! *Smiling* at all my sweet comments. Looking forward to hopping around the blog list. Thanks, Alex! Thanks for creating this site, Alex. I'm off now to check out some blogs. I almost missed today's but it is up now! I will be popping in to read other's posts tomorrow! I just signed up for the second time-- sorry I didn't participate the first time around, but life got really hectic. I'll be sure to post next Wednesday! LOVE LOVE LOVE this! I'm a late-comer, but I've already written two posts on the topic (scheduled for future posting). Thanks for the great idea! Great idea! I just found out. Hope to see you all in December. Okay. I'm hoping on board. This is the right time and the right place for me this month. Will post today, my first Wed. Thank you everyone who has joined! I am so amazed by the outpouring for this group and the support you show one another. Hey Alex, I'm planning to write for the hop on 12/7, and I'd like to use the IWSG icon - how can I get my hands on it? I am late arriving but I'm here lol Thanks for doing this. I sure need it. is it just me or are there a LOT of missing in action insecure writers this first wednesday in December. Me, being monkey me, posted mine on Tuesday - got my days mixed up - and needed to repost for today. I have received more support from this site than anywhere else (family included). Thank you again Alex! I've just joined - hope it's OK if I make this month's posting a few days late? Sounds like something I could do. My Wednesday blog slot is open since I canceled my weekly serial. Alex, what a wonderful blog hop. I can't wait to begin 2012 and join the team! Does anyone know if there's a way to change the link? My URL has changed from what it was at the start of this bloghop and I'd hate for people to go out to the wrong blog. There's a message there re-directing people to the new blog (should they be so inclined) but I'd still like to spare them the trouble if I can. Should I delete myself and just re-enter with the new URL? Can I delete myself or does someone with admin capabilities have to do that? I'm going to have to sign up for this next month. I have been through a lot of painful, embarrassing things with my writing, including having family members "anonymously" post some really rude reviews of my stories on Amazon. My new novel, "Our Gal Cal," (recently published by BearManor Fiction) is actually a series of 4 novels in 1 volume. So far, I've heard back from 3 women and 1 man. The women love it. The man doesn't. Where would I publicize my book in a way that women are the ones most likely to buy it? Alex, thanks for hosting this group! Well, I missed it by a day. I have a really good reason though!! I'll be posting about it on my blog today. 8:30 a.m. central time. I received some not-so-great medical news yesterday about myself. Not sure what it holds for my future. But, like most of life's hurdles, I find a way of jumping them. Best of luck in 2012, Insecure Writer's Group!!! Candy, I'll be praying for you! Bragon, I will get to the bottom of the list! I joined the blog hop months ago but kept missing the First Wednesday event. Today's blog on my website addresses writers' fear. It's comforting to know I am not alone when these insecurities strike. Thanks to all the bloggers for your inspiration. Hi Alex - can't you delete my first linky? #241 - it's not attached to the specific post, just the home page. Thank you! Oops! Sorry if I already sent this, but I wasn't sure if it went through. Can you delete my linky #241? I realized that it was attached to my home page instead of the specific blog post. I signed up correctly this time. Thank you! It looks like I dropped off the blog hop -- I tried signing up again but it says I've already done so? Just checking -- thanks for the support group I've received some great feedback. ABnormal, let me see if I can't get you back on the list! Thanks, Alex, I really need the group this month! Very excited - first week that I'm taking part in this :) Thanks for providing such a great group for support! See you over at Brinda Berry's blog all the time. I hopped over here to join the fun! As I'm sure Alex will tell you, no way is it too late to sign up! I don't believe it'll ever be too late. Just now stumbling onto this, though I just posted an entry about fear this past Tuesday. Too bad I didn't know about it then! Is this still an ongoing group? Will anyone be posting this month since it's A to Z Challenge? I will sign up if's it's still a go! Yes, this group will post April 4 during the Challenge! Just what the doctor ordered. Thanx. What an awesome idea this is. So happy to jump aboard. Sorry I missed the April 4th post. Though almost every post I made before April would qualify I thin. Alex, this looks great. I plan to join the group after A to Z.
I've looked at this page in Firefox and Chrome and can't see where to sign up??? Okay, I'm a Follower now but I'm insecure about joining the Insecure Blog Hop! This is a wonderful idea and group, so I'll at least read along for a wee while and consider jumping in. Cheers! Alex, can you remove Sydney Aaliyah Writes #246 from the blog list. I combined this blog into my main blog Sydney Aaliyah which I have added to the list. Thanks and great idea. I am looking forward to my first first Wednesday. I added my blog Bindu Blogs. But is not visible in the links. Should I place my link again to be included? Bind, your link is now showing - good to go! Wondering if we have a Twitter hashtag? I used #insecurewritersgroup but that sure is a long one. LOL! What a great idea Alex! I'm looking forward to reading a bunch of new blogs and making some new online buddies. Hey Alex, don't know what is going on but I left a comment last night somewhere around Rek's and Melissa's but it isn't there now! Google!! Well I just said that you definitely need a break, catch up with your family and do not feel guilty. You deserve it! LATE, but made it! For the record, this is my only commitment (husband excluded). I popped over here after reading JW Alden's blog and I'm glad I did! Thanks for sharing. I missed the first Wednesday post because I'd forgotten I signed up for the group! Egads! I went to sign up for it just now and it told me I'd already signed up for it . . . how monumentally stupid is that??! I just found out about this from Mediea Sharif's blog, so I'm pretty sure I missed the first one. But I would really like to join if it's not too late? I just joined and want to make sure I have this correct. Do we have to visit every blog on the list to remain? And can it be done throughout the week? I don't want to get bumped off the list and I want to visit as many as I can. Please let me know! Thanks. Is it too late to join this group? I hope not! Yay! I'm psyched to join. I hope I'm good enough to be part of this group, hee hee. Signed up just in time for June's posting. Looking forward to it. Thanks Alex! Thank you for the opportunity to participate. I know I'm going to enjoy this. I'm posting here today for the first time. Wow, this looks like an amazing place. Randi Lee pointed this place out and it would be perfect for me. Like everyone else, I got loads of insecurities going on concerning writing. This looks like an amazing group! I can't wait to sign and start up! Thanks for this! Looks like this is a a huge help and a wonderful support group. I am very excited about joining this! But I made a dumb mistake and put in the wrong title for my blog (I put Prose Dreaming when it is The Dream Words) Is there anyway to change this? Thank you for your time! Paige, I'll fix it for you. This is such an amazing idea and contribution to the writing community. Thanks so much for being such a stellar person and putting this group together! I am definitely going to join in this next month and have already found a few cool people through it. What a great idea. If that's okay, hope am all doing the right thing, tomorrow will be doing lots more encouraging and visiting new people! Wow, I recognize lots of people. Great to be here. I'm a master at insecurity, so sign me up! I love the IWSG concept and am looking forward to participating for my first time in August. 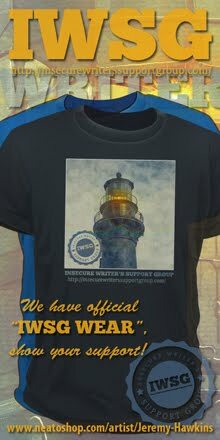 Question: I would love to add the IWSG badge to my blog but am struggling with how to do this. I am on blogspot.com. Any suggestions for the technically insufficient? Sign me up for the next one! Just went to sign up and discovered I had already beaten myself to it. Loving the concept - No matter how confident you may be about what you write, it really only takes one bad review to knock you sideways. Had one such a while back and nearly gave up, even started deleting different accounts.. But then, after several people pointed out to me that one bad review among fifteen good ones was par for the course, I decided to face it out. I write flash fiction and there are still an awful lot of people out there who just don't get it..
Oh CRAP... Monkey ME begging for mercy!!! oh please, please, let me back in. I'll clean out your cat box for the next month if you'll reconsider. OKAY, two months. This sounds like my kind of writer's group, all right. I am uncomfortable in large group settings, I can't stand to have my picture taken, and I lack confidence in many ways. I have overcome a few times over the years, like when I decided to acquire my Master of Fine Arts degree in Creative Writing. Blogging has offered another brave new world for me. I often fear that people will not like my voice or my style, but I'm learning to be content with who I am and to be truthful about what I really feel. As an unconventional spiritual writer, I admire people like Donald Miller and Shane Claiborne who have broken the mold of Christian formula writing and found success. I love writing enough to keep going whether there is a market for my work or not. Writing is my form of worship. The IWSG idea is amazing! Thank you for creating such a supportive group. I am making the jump with both feet today, very late. I'll probably miss, but I'm jumping. Good coffee and a blog hop, well hello fiday. Thanks, Alex. There are many(most) writers who need a kind word and a gentle push from time to time. Great thing you're doing! Darn, I missed it. I'll be jumping in next month! My blog address has changed... How can I change it in the linky list? PS- It's only the address, the title is still the same. Alex, I made an error, so had to re-enter the linky thing. Entry 266 is now wrong. 267 is the correct one. I'm looking forward to doing the first one! If not, let me know and I'll add it again on the bottom. My post was done a couple of hours early, and can be read on the "Scribbles" page on my blog. I am thankful for this encouraging site and the one who founded it! I can't believe this is already my 2nd post. Woo hoo IWSG! Sire, hope you're having a great day. I like you concept and want to join, but can't find the "Join us" link or button. Hey Daniel! Click where it says "Click here to enter" and add your blog's address. It was down for an hour today - blame Linky Tools! Insecure Writers - very good idea. Hi - I'd like to nominate you for the One Lovely Blog Award. Do pop over and check out my Fluffy Moments Page tomorrow and you will find the details. Thank you for putting this together! Awesome idea - we writers need to know we're not alone. Michael Di Gesu suggested I link up my post here and it was through him that I got to know about you. This is such a fantastic idea! Thanks Alex! This is a great way to find like-minded people and get some support. I just linked up my first post. Thanks Alex for coming up with this idea. It's fantastic! I am so happy I found you fascinating people. I am eager to discover new interesting friends with powerful words on the tip of their pens. And I've finally joined. Hazzah! I've been meaning to join this for ages, but it's pretty cool to be #293. Woot. Hi Alex, I'm #233 - Portable Magic. Unfortunately I'm a bit busy at the moment and since I don't want people to click where there is nothing I would appreciate it if you could take me off the list! Might come back in the future, until then good luck with everything everyone! Looking forward to joining in on the fun the first Wed. of November. I'll be doing NaNo, so it will probably be a short blurb about that. Alex...me again. Hey, I just revamped my blog and have a new website for it. Currently, I'm number 299 (Treading Water in the Goldfish Bowl). That blog has now taken a different direction and is no longer about writing. You can take that off the list. My new one is called ML Swift, Chasing Windmills. I've already signed up that one through Linky. So if you could, please remove Treading Water. Thanks! See you Wednesday! There. Now both of my blogs are listed. Word Weavers is new. I'm hoping to have a couple of the authors in the group give me stuff to post for this. It'll change every month too! Yay! Double duty for you, Mel! Just to be clear on the concept here, is the idea just to write whatever we want, around our insecurities and so on, and for others to drop by, give advice, so on? If so, that seems a fantastic idea, and there's clearly a community of a decent size already. Okay, I'll definitely post something on Wednesday. My address, for anyone who wants to click through and visit, is noonebutabloghead.wordpress.com. Alex, can you remove #126 (My Write Spot). I moved from Blogger to Word Press and I just added the new link. Thanks! How do you sign up? This sounds like the kind of group I need. I'm looking forward to joining this support group. I sure could use it sometime. I will start next month though, as I've been overloaded with postings lately. Thanks for this! How do I join this group? Just found out about this - what a great idea! Wednesday is always the hardest day of the week for me - my friends and I used to call it "Shrek" day because it can leave you feeling like an Ogre (though, sadly, not the Dreamworks version). I found out about this from Vikki and The View from the Outside (http://the-view-outside.com/), and I'm looking forward to checking in every first Wednesday. I've been impressed by and praising IWSG for a while now. Maybe it's about time I sign up. Almost ready to make the commitment. Hi Alex, finally decided to join. love the idea of this. will add badge to my blog now. Just signed up. Looking forward to January 2nd! I'm excited to join in the discussion! Thanks for hosting. I am excited to join this group today. Today was my first time participating in the Blog Hop and I have had the best time reading everyone's posts. I am so glad I found this group. Thanks so much to everyone. I would love to join this group. Thanks so much for starting this! Might I say again how much I adore this group? I'm joining the group, too! IWSG has helped me so much these last couple of months. You guys rock! Just wanted to let you know, I've changed the name of my blog from Writing. Family. Life. (#247 above) to E. K. Carmel's Blog. The link above will still work, I just didn't want anyone to get confused by seeing a different name once they clicked over. I posted to my blog, added link to yours......I feel like a real writer now!!!! Thanks so much for starting this group. What a GREAT idea...Insecure Writers Support Group! I think even Stephen King could have joined this group at ONE time! I'm praying for much success for you!